On January 16, 2019, a joint meeting was held with the participation of leaders and students of the Maxim Tank Minsk State Pedagogical University at the Minsk National Linguistic University. The meeting with Turkmen students was attended by the Turkmen delegation consisting of the Deputy Chairman of the Central Council of the Youth Union of Turkmenistan named after Magtymguly and Director of the National Institute of Education of Turkmenistan, which was in the Republic of Belarus on a working visit from January 11 to 19, 2019. During the meeting, between the leaders and representatives of higher educational institutions of the two countries an exchange of views on questions related to Turkmen students took place. Also, the members of the delegation and responsible heads of universities inspected students' hostels and their living conditions. In addition, the delegation members were acquainted with the student canteen, medical center, sports complex, social services and shopping centers. 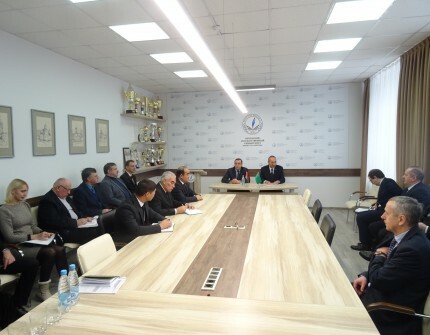 Also on January 14-16, with the participation of the members of the Turkmen delegation, the same meetings with Turkmen students were held in the universities located in different cities of the Republic of Belarus.